Being afraid of the unknown is also like being afraid of your true potential, a fear of embracing your own power. You vs can't, won't, or should have. Make friends with the unknown, come to peace with it. That's the true difference between athletes and regular people, athletes can play anywhere against anyone. Most of us fear what we don't know. Just like babies, our job as adults is to develop as a human being. 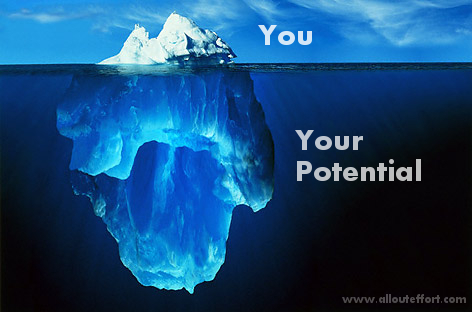 That means pulling more of that iceberg out of that unknown every day. Trying to learn more, laugh more, move more, sleep better, fall in love, look better, make more friends, no longer fear taking that first step because you don't know where it will lead, and ultimately making a leap of faith. It's the universal theme of all hero's journeys. KNOWINGLY entering the unknown because you believe you will come out the other side better than you are now.